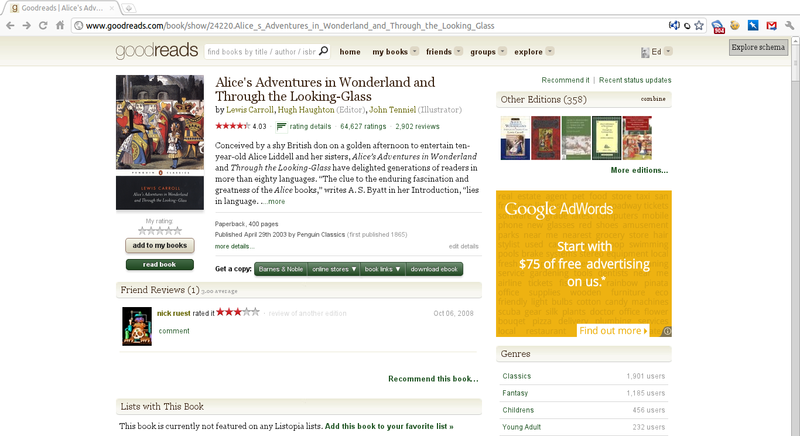 I’m not sure how long it has been there, but I just happened to notice that GoodReads (the popular social networking site for book lovers to share what they are reading and have read) has implemented HTML5 Microdata to make metadata for books available in the HTML of their pages. GoodReads has chosen to use the the Book type from schema.org vocabulary, most likely because the big three search engines (Google, Bing and Yahoo) announced that they will use the metadata to enhance their search results. So web publishers are motivated to publish metadata in their pages, not because it’s the “right” thing to do, but because they want to drive traffic to their websites. If you are new to HTML5 Microdata, schema.org and what it means for books, check out Eric Hellman’s recent post Spoonfeeding Library Data to Search Engines. And if you are generally curious about HTML5 Microdata, the chapter in Mark Pilgrim’s Dive into HTML5 is really quite good. If you have spent a bit of time writing screenscrapers in the past, this should make your jaw drop a bit. What’s more they’ve also added Microdata to the search results page, so you can see metadata for all the books in the results, for example using Google’s Rich Snippets Testing Tool. Issues of “valid” HTML5 aside, this discussion highlighted for me just how far the world of metadata on the Web has advanced since a small group of library hackers worked on unAPI. The use of HTML5 Microdata and schema.org by Google, Bing and Yahoo, and the use of RDFa by Facebook are great examples of some mainstream solutions to what some of us were trying to achieve with unAPI. Seeing sites like GoodReads implement Microdata, and announcements like Opera support for Microdata are good reminders that the library software development community is best served by paying attention to mainstream solutions, as they become available, even if they eclipse homegrown stopgap solutions.